Ever since Eastgate Systems released Storyspace 3, I have been thinking how amazing it is that it has not only made it to El Capitan, but what a joy it is to use again. I developed and supported a range of CAD/CAM applications for Classic Mac OS from 1989 until 2001, when the arrival of OS X would have required their complete rewriting. I know the long weeks of long days and nights, the enduring effort and many frustrations of developing for an operating system that often seems more like quicksilver than bedrock. So over the months that I have been using Storyspace 3, then 3.0.1 in December 2015, and posting tutorials and demos here, it was no surprise that a few minor warts and frustrations started to grow. As they do when you use any software. Then, back in March came Tinderbox 6.5, which felt so much smoother. Some of the recent features which had been added to Tinderbox, in particular the Go Back command, seemed so valuable in Storyspace it was a little frustrating that they weren’t there, yet. Ironically, when Eastgate released Storyspace 3.1, I had little time to do anything more than upgrade, and checked that it worked. Now that I have had a few more hours using it, I realise the transformation which has taken place. All those warts and frustrations have gone – and it has grown a Go Back command to boot. At the moment, and one of the reasons for my time being even more pressed than usual, I am grappling with Masaccio’s short but dazzling career as a painter. If you read the painting pages here, you will have noticed how this was reflected in a recent flurry of articles. They are but the tip of an iceberg in terms of reading and research. I am currently trying to get my head around the timeline of his work. We may only have seven substantive pieces of work by him (his panels for the Polyptych of Pisa, and paintings in the Brancacci Chapel counting as one each), but they were all completed between 1422 and his death in the summer or autumn of 1428. Working out the order in which he painted them, and when, is something of a conundrum. This is only part of my project, but a central part. To help me I have a small library of books and articles, each of which proposes different sets of dates. I need to work through the possibilities and the evidence, then flesh that out with his movements and other events, into a hypertext narrative. This needs to integrate with his collaborator in some of those paintings, Masolino, and events in Florence. For a pure timeline, the new version of Aeon Timeline looks excellent, but it only does timelines. Storyspace will take me on to the hypertext narrative too, like no other product. I have started in my usual way, scaling images of paintings (at least with Masaccio we don’t have so many of them to worry about), and using GraphicConverter ensuring that they all use a 72 dpi resolution. That ensures that they get scaled properly when dropped into a writing space. 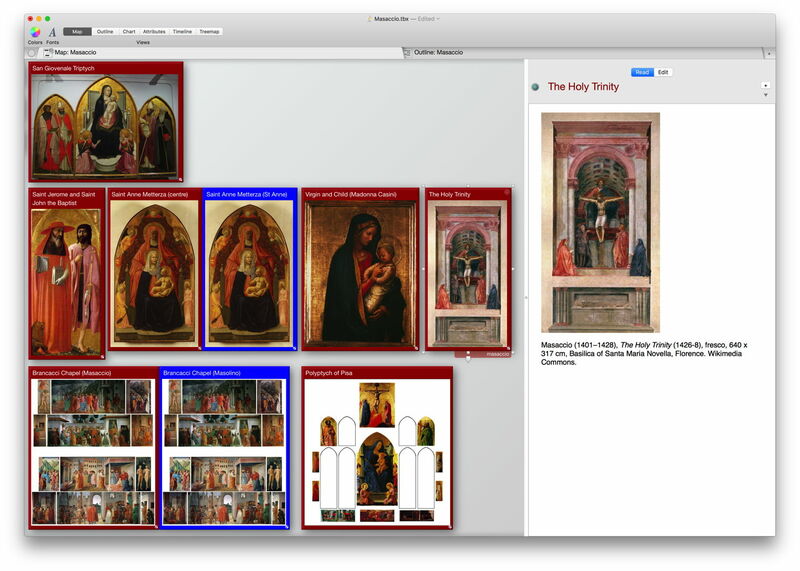 This time I have been even more structured with my prototypes: there is a generic painting prototype, then derived from that I have a prototype for Masaccio, another for Masolino, and a fourth for Filippino Lippi (who was commissioned around 50 years later to finish off the Brancacci Chapel). Each is set to use a contrasting colour to maintain contrast and clarity. This Map view looks even more gorgeous than those I have created before, and shows Masaccio’s entire surviving output. Where he and Masolino collaborated, I have simply duplicated the writing space, edited the titles, and switched one to use the masolino prototype instead of masaccio. This is the timeline using the dates most commonly accepted for Masaccio’s paintings, as given for example by JT Spike in his monograph. More recent evidence, particularly that from detailed examination of his panel paintings, proposes quite a different timeline. I hope that it looks a bit more feasible. Timelines were one of the more juddery parts of Storyspace 3.0.1. Getting them to scale and rescale correctly sometimes required a fair bit of twiddling and tweaking. That has changed completely now: they are really smooth and scale perfectly. Similarly, setting up divided windows no longer requires iterative adjustment, but works properly. This has only been a brief encounter with Storyspace 3.1, but it feels hugely improved, and much more like its sibling Tinderbox 6.5. I am eagerly looking forward to implementing references using the Go Back command, for example: they were clumsy at best without Go Back, and now should be quick, slick, and simple. Storyspace 3.1 makes a world of difference. Posted in General, Macs, Painting, Technology and tagged Eastgate, hypermedia, hypertext, Masaccio, Storyspace, Timeline, update. Bookmark the permalink.